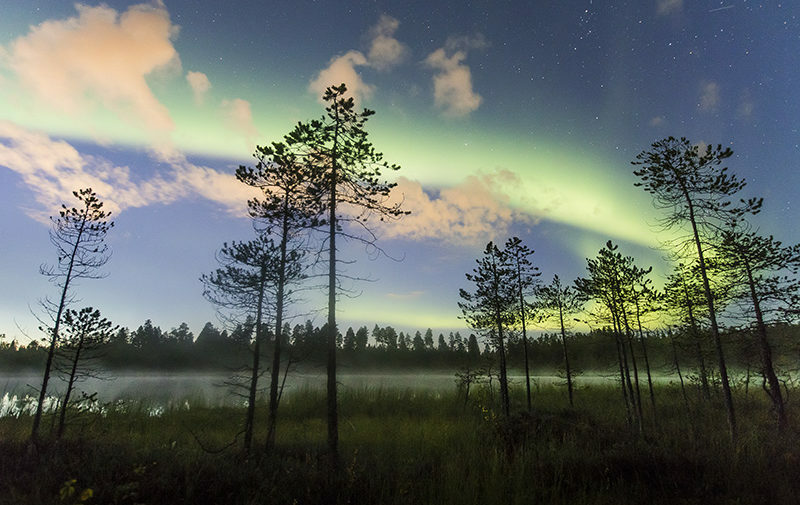 Autumn is prime time for Aurora Borealis viewing in Rovaniemi, Lapland, Finland. This year, Northern Lights buffs have been treated to several consecutive nights of aurora displays in the first few days of September. On Saturday 2nd September, a spectacular light show presented itself above the arctic city and local aurora hunter Alexander Kuznetsov would not miss a minute of it. – The auroras appeared a couple of hours after sunset, when the sky was still partially bright, and continued to dance for hours, he says. Kuznetsov has been photographing and studying the Aurora Borealis for years. Like other experts, he has faced concerns over reduced Northern Lights displays in the near future due to an approaching solar minimum, which Nasa expects in 2019-2020. The solar minimum is the lowest point of activity in the 11-year solar cycle, and has been said to lessen Northern Lights sightings. However, the matter is not unequivocal: the auroras still appear, but areas where they can be spotted diminish. Areas most unaffected by the solar minimum are those closest to Earth’s poles. Rovaniemi, the Official Hometown of Santa Claus, lies on the Arctic Circle, making the city an aurora destination that needs not worry about the looming solar minimum; the Aurora Borealis will surely be seen during the season (mid-August to mid-April) in the years to come just as they have to this day.